This Salmon Foil Packet recipe came about recently for me as I have been interested in finding ways to eat healthier. I had come across multiple articles recommending that we eat fish at least twice a week. 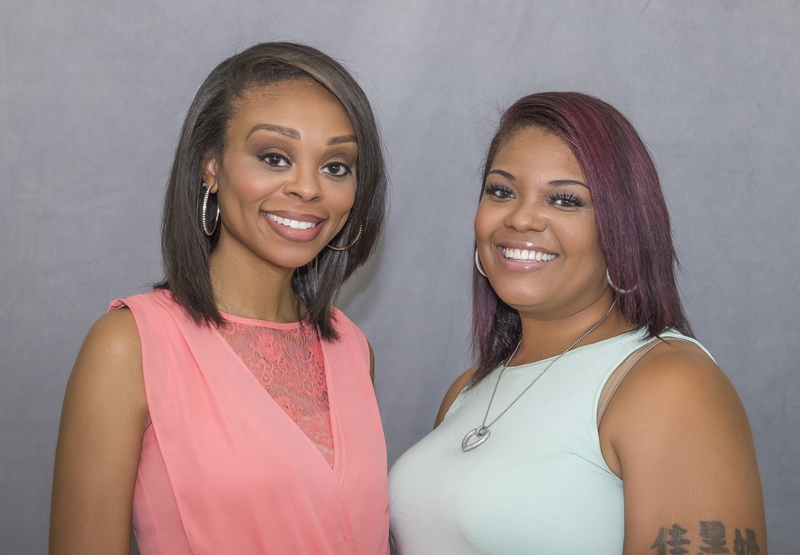 Although I love seafood, I have never been fond of cooking fish in the house as I do not like how the smell that permeates through the house. On this quest to eat healthier, I figured I needed to incorporate fish into my more often and I love this garlic butter salmon recipe as it is quick, easy and tasty! The carrot recipe actually has a funny background story. When I first met my now husband and we were dating he had basically expressed his disdain for almost every vegetable on the planet with the exception of two: broccoli and bowl of ranch with a salad on the side. Ironically, on our wedding day our first meal as a married couple was Southwest chicken with a side of veggies and carrots and to my surprise he ate every last carrot on the plate. This carrot recipe stems from two wedding gifts we received which was a spice rack and a steamer. My goal was to try and to emulate the same carrots my husband loved on our wedding day and make him see the beauty in veggies. Slice potatoes, orange and lemon. Grab a glass Pyrex dish and combine butter, garlic, thyme and oregano. Place bowl into microwave and use a melt butter setting. Once the butter has melted, you can do a taste test to see if you like the seasoning as-is or modify to your liking. Prepare foil packet by spraying a non-stick spray on all sides and begin placing potatoes into packet. Then place fish on top of potatoes. Pour butter mix over fish and place lemon and orange slices on top. At this point you can sprinkle salt, pepper and Dash seasoning over salmon. 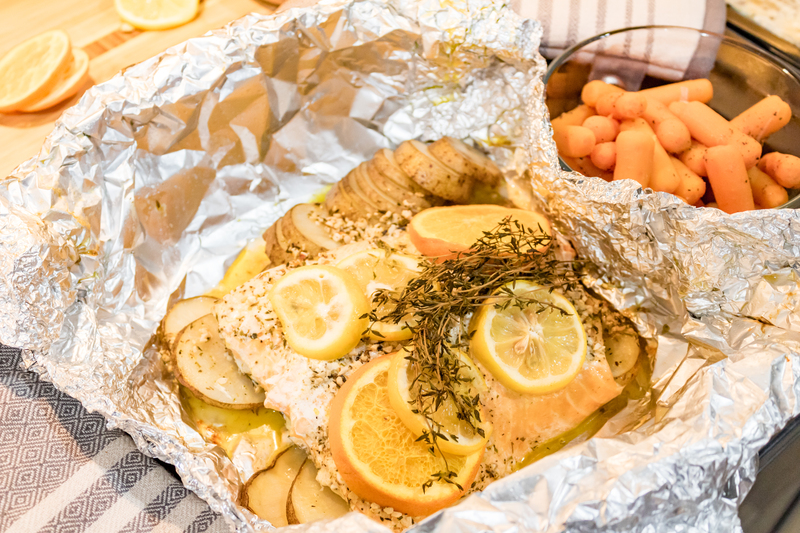 Fold up foil on all sides and place into oven until the internal temperature reaches 145 degrees Fahrenheit or after cooking fish for 25 mins. Put ingredients for carrots into glass dish and cover with saran wrap and place in microwave on steam setting to cook and then stir occasionally until carrots are juicy and tender. Note: If you do not want to use the microwave you can also cook the carrots on a stovetop or in a steamer (which is how I cook my carrots) and still use the same ingredients. Another great tool to use if you would like to preserve the remainder of your fish (in the event you only use a pound) is a vacuum sealer which will ensure your fish remains fresh and tender even after being placed in the freezer. If you are in the market for a vacuum sealer check out this guide by clicking here. In my opinion, a good meal is only better with a glass of wine. 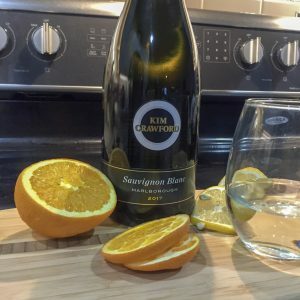 If you are looking for a good wine pairing, I would recommend a Sauvignon Blanc with fish and a bottle of Kim Crawford is the route to go. The citrus flavor found in this wine will play with herbs and spices perfectly.